SO GET THIS: Some of the RIT Hospitality students are here in Dubai!! Including none other than THE Evan Coyne!! In preparation for their arrival I did a ton of my homework already this past weekend. I was hoping to hang out with them a few days this week and I didn't want any school work holding me back. They arrived last night and I met them at their hotel just to touch base. The group actually looked pretty decent for having just been on a 13 hour plane ride. I didn't stay long but it was great to see where they were staying and meet some of the other people in the group. Today the Hospitality group was doing the Big Bus Tour. We already did this at the beginning of our trip but I decided hanging out with them for the day would be completely worth it. Turns out I saw a ton of new things that I didn't even see last time. Evan and Me aka: some cool kids chillin at the back of the bus. Archeological dig exhibit. The dug up grave models were creepily realistic. Some statues of old school Arabic people....wait nvm that's Evan on the left. 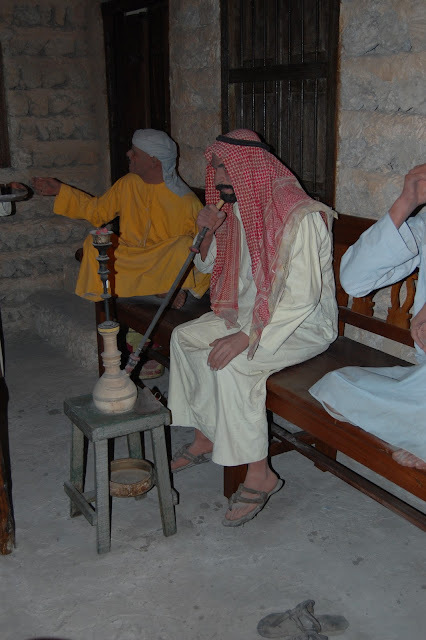 Old school Arabic dude smoking sheesha. With the low lighting and the detailed features, these statues looked just like humans. Every time I'd walk around a corner I would have to decipher whether there were any other real people in the room or if they were all statues. It caught me off guard a couple times. Once, there was a real guy standing still and for about 5 minutes I just assumed he was another museum statute that was part of the display. Then out of the corner of my eye I saw him walk away, ahhhH!! THE STATUES ARE ALLIIIIIIVE!! 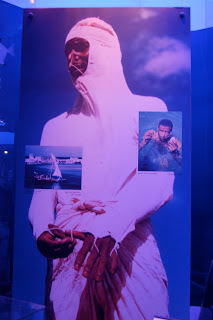 My favorite part of the museum: the Pearl Diving Exhibit. Back in they day, like all the way back to somewhere near the 14th century, people from what is now the UAE used to search the Arabian Gulf for pearls. They would only wear a nose clip to dive up to 40m deep and had to hold their breath for up to five minutes at a time for each dive! They'd have a rock tied to their foot to help them sink to the ocean floor. A basket was tied around their neck so that they could use both hads to collect as many oysters as possible. This went on all the up until the 1920s. The pearls were a great thing for families to barter and sell to traders but the risk of diving for them was high. Some families would even live right on the coast for the four months of the pearling season but then move back to the desert for the rest of the year. 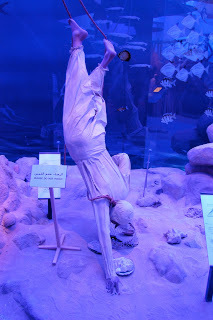 Pearl diving in old Dubai, definitely my favorite historical topic so far on this trip. Me and Evan by the abra boats at Dubai Creek. Gotta love those UAE flags scattered in the background. Craig and Rick being cool. 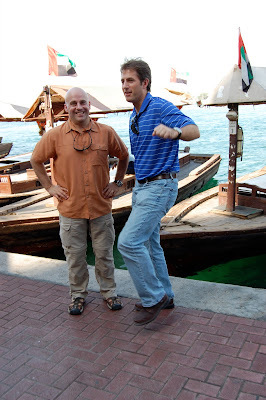 Rick was the organizer of the whole Dubai class/trip. The gold souk was sort of a partially covered street with a ton of shops along each side. All the window displays were so shiny they made my eyes hurt. We walked around and looked at a bunch of super expensive jewelery and gold stuff that we had no intention of buying. Random guys would appear out of no where and start whispering under their breath in an accented voice "Gucci Pradda Gucci Prada" or "Handbags watches handbags watches". We just said no thanks every time. Creepiest sales dudes ever. I don't doubt that they had some great designer brand name stuff (or awesome knock offs) I just wonder how they managed to acquire these products. Because if it was legally, then I feel like you wouldn't have to whisper to potential buyers on the street. It was an entertaining stroll to say the least. One guy was actually really impressive. He listed off about 15 designer brand names and didn't repeat a single one. Clearly he had practiced. Albandar restaurant. It was right along the creek. A bunch of people stopped here for some lunch. The food was pretty good and it was great to eat outside by the Creek. Traci and Evan at lunch at Albandar. Evan on the abra boat (left) and an empty abra taxi boat (right). 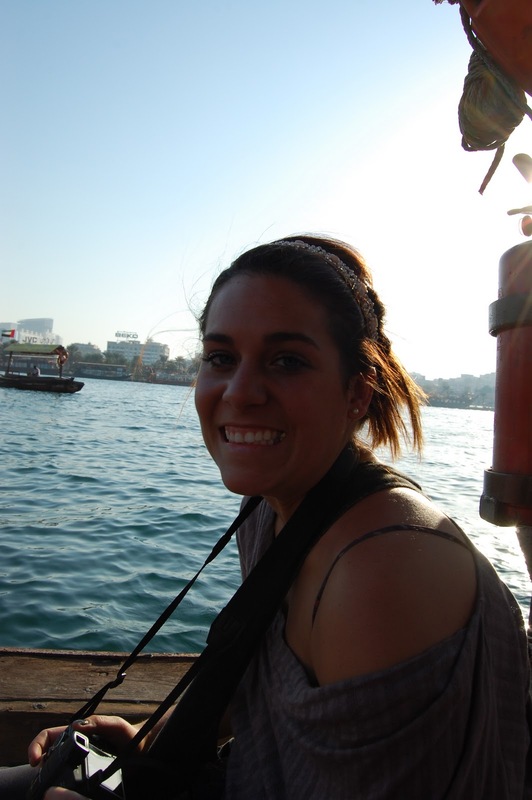 At one point we were on one side of Dubai Creek and wanted to catch the bus at a stop on the other side. Solution: abra taxi. These little boats (pictured right) go back and forth all day long bringing people to different stops along the creek. A security man assured us this one boat would bring us to the other side so we hopped on. Other people loaded onto the boat. They're just open platform type boats so you sort of sit along a bench on either side, facing out towards the water. Evan and I sat down and watched as more people filled up the seats on the abra. We paid the driver our 1 AED (equivalent of 30 cents) and then we were on our way. The boat got out on the creek and turned right. After 5 minutes of heading down the Creek it was clear that this thing was not going straight across. Our side of passengers was something like this: Arab man, Indian man, Arab man, Egyptian man, Arab man, Arab man, white girl, white girl. So basically it was us and the locals on this abra boat. Quality!! We did end up making it to the other side of the Creek, it was just about a 20 minute walk down from where we needed to be. No worries, we did end up finding the next bus stop. The sunset I tried to catch a picture of from the top of the moving bus. We caught one of the last busses back to Diera City Center and called it a day. Sounds like everyone had some good adventures during the Big Bus Tour. Saw a little more of the Flora Creek Hotel that they are staying in. That place is NICE. And in a great location right around the Creek. Not gonna lie, I'm pretty jealous of their awesome rooms with the outdoor balconies, couches and flat screen TVs. They'll definitely be living the life this week. Eventually I caught the metro at Diera and headed back to Etisalat Academy. Turns out the Big Bus Tour was even better the second time around! !